ENJOY the silence became an ironic title to an encore that was anything but quiet as Depeche Mode rounded off a thrilling set at the Barrowlands. 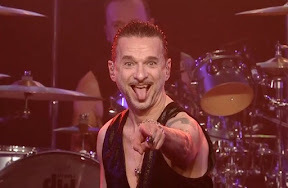 Dave Gahan, Martin and Andy last played the legendary Glasgow venue in 1984 and whipped us all into a frenzy as they were unleashed upon the crowd once again. Only 1400 of us were lucky enough to gain entry to the hallowed space but unlimited access was given online to those not jammy enough to nab a ticket. Those who were there knew how fortunate they were and the excitement was truly palpable as the electro pioneers took to the stage for BBC 6 Music Fest. Set opener Going Backwards set the precedent for the evening as the trio performed newer tracks before heading backwards to where it all began. So Much Love was also new but had the synthy stamp of the eighties as we were taken on a journey of old and new. The crowd lapped up every pulsating beat as Dave camply wiggled his hips and strutted around the stage. The once cute fresh faced frontman was now more akin to a rock God with his moves as he gyrated and stomped, waving his arms around manically. We may not have been treated to Just Cant Get Enough but tracks like World In My Eyes from the 90s Violator album brought back memories of dancing in sweaty night clubs amid a purple haze. The Barrowlands floor was bouncing and the atmosphere was amped a notch higher as the set hurtled only too quickly towards its end. But we were treated to a few more before the band called it a night. Where's the Revolution got everyone marching along as Dave offered up his deep throaty vocals to an ever appreciative crowd. Of course Martin Gore sang his solo as he got stuck into Home and then it was time for Walking In My Shoes with Dave doing a Freddy Mercury and lifting up his mike stand. Messed up edgy Barrel of a Gun brought some darkness before the brilliant Personal Jesus, inspired by Priscilla Presley's love for Elvis. It was a real crowd pleaser from the moment we heard the famous opening notes. Huge classic Enjoy the Silence ended the set all too abruptly as Dave said: "See you next time." We hope he won't make us wait another thirty odd years before he turns up in this part of town again. Glasgow like the rest of the world just can't get enough.